To reach Sarastro’s temple of wisdom, you have to climb a series of exquisitely manicured terraces to a tiny cloister in one of the world’s great gardens. Iford Arts have been inviting high-quality small opera companies to perform and producing their own operas since 2005. Charles Court Opera, paragon of G&S and boutique panto, was the right team to ask to provide a Magic Flute tailored for a cast of nine and an audience of 80. The peripherals matter here, not least because you can enjoy a picnic in peace and quiet before the show, unencumbered by evening dress (“smart casual” is the suggestion), in surroundings which give Glyndebourne and Garsington a run for their money. Iford Manor Garden creates the illusion of spaciousness in what is in fact a narrow strip sloping down to the river Avon. A genius in marrying stonework to careful planting, Harold Peto knew where to place his collection of Italian antiquities, and the translated Renaissance cloister is at the zenith of the garden before the wild woods with their high trees begin. Within it, Charles Court Opera’s designer Simon Bejer has enclosed the courtyard with overhead vines. Tamino is an explorer seeking enlightenment, not a prince, lost in a South American jungle and Papageno’s pipes give the cue for Andean colour in his and Papagena’s cheery costumes. Director John Savournin and conductor John Eaton have given Schikaneder’s mix of Freemasonry and vaudeville a complete makeover in their new translation so that there’s no serpent, at least not when you expect it, no portrait of Pamina to lead Tamino onwards – later, though, there’s play with two dolls – and various substitutes for the Three Boys supposed to lead the hero and his sidekick onwards. Those find Savournin at his most resourceful, and ask much more than usual from the Three Ladies. 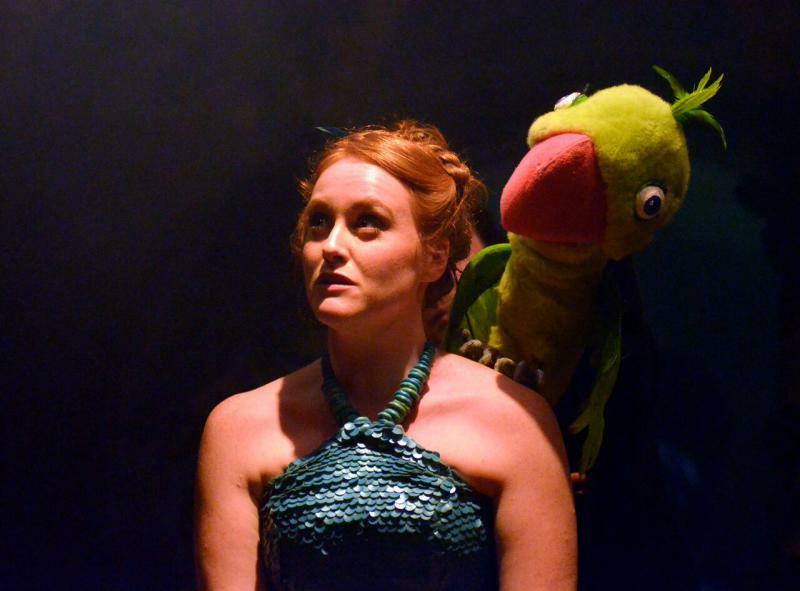 Catrine Kirkman, who last year gave one of the funniest stage turns ever as an Essex girl plaintiff in CCO’s consummate Trial by Jury, doubles as Papagena, and all three team up with a giant head to play the Old Woman eventually transfigured into birdwoman. Kirkman, Lucinda Stuart-Grant and Amy J Payne (another G&S stalwart; all three pictured above with John-Colyn Gyeantey) not only serve as the choral sect-members but also manipulate glow-worm lights, snakes and bird-puppets as this production’s answer to the “Boys”. The most enchanting scene of all is that of Pamina rescued by the cheery birds from suicide when she thinks Tamino no longer loves her. It’s superbly sung by all four women, too. Guildhall student Claire Lees is the discovery of the evening: no sooner has one lyric soprano, Louise Alder, graduated and taken wing than another appears on the scene. Lees has wonderful pluck and dignity, looks like a young Julianne Moore and manages all the difficult phrases, above all in Pamina’s lament, to radiant perfection. Like Alder, she’ll make a radiant Sophie in Der Rosenkavalier and her Pamina would already grace any stage. There’s delightful interplay, too, between her and John-Colyn Gyeantey’s Tamino: first meeting and reconciliation – “Tamino mine” as moving as it was when Lucy Crowe sang it at ENO – hit the heights. 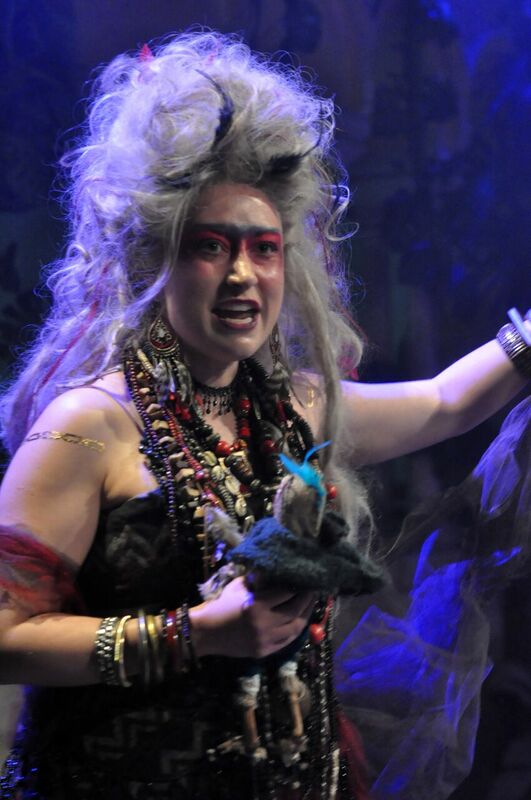 Gyeantey’s fast vibrato takes some adjusting to; Hannah Sawle as the Queen of the Night (pictured above), looking like a cross between Amy Winehouse and Martita Hunt as David Lean’s Miss Havisham, is even more extreme in that respect, but unlike many she has all the top notes. Certainly, though, Gyeantey is the real tenor article, and his musicality soon wins us over; the other highlight of the evening is the urgency of Tamino’s scene with the Speaker, here also the Sarastro, Benjamin Cahn (pictured below). A baritone, maybe, rather than a bass, though he could manage the low notes. Curious, too, that the American accent of this Inca chief inclined us to think of the noble Sarastro as a jargony cult leader; Savournin and Eaton clearly want us to take the wisdom seriously, and make a pertinent reference to recent events in a plea not to take everything that’s said by immoral people at face value (“think critically”). There I take issue with the idea that this Tamino sets the flute aside as part of the superstitious apparatus and tells Pamina they must face the final trial with their own knowledge alone. Cut the trials of fire and water and the most movingly simple music of the opera which goes with them, and you leave a gaping hole. In any case the one thing this production badly needs is reflective space, a will to trust the intimacy with some quieter singing and to relax the pace. Eaton gets authentic liveliness from his 12-piece orchestra but sometimes drives them and the singers too hard. There are some fine solos, especially from the oboe, and it’s a luxury under the circumstances to have a real Mozartian glockenspiel for Papageno’s wind-up musical box. 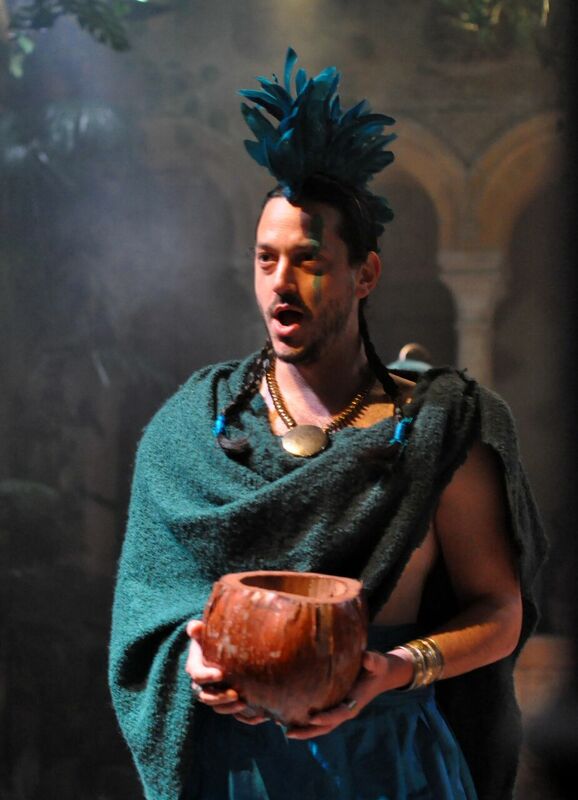 Every word can be heard, but less would sometimes be more, especially from the Papageno of Matthew Kellett, who’s usually very funny indeed. Take these as production notes, though; this Flute already has the makings of a very fine show, creating and sustaining a world with help from the pillars and arches of Iford’s unique little cloister-“theatre”. The overall experience merits much more than the three stars reluctantly applied here.